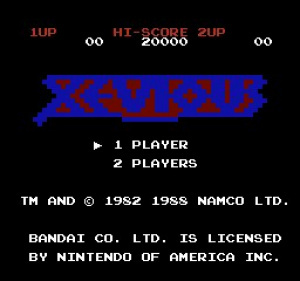 Following its success with Pac-Man and Galaga in the arcades, it seemed that Namco was unstoppable. The release of Xevious only helped to cement this idea: it was first one of the earliest examples of a vertical scrolling shooter and innovative for its time. 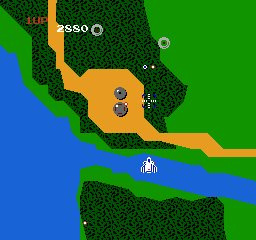 The action in Xevious takes place on two parallel plains; your spacecraft gets attacked from the ground in addition to aerial assaults. You can attack straight ahead of you, as is the norm in this type of game, but more interestingly you can also drop bombs on ground-based enemies, using a fixed target ahead of your ship . There are a number of secrets throughout the game, such as extra ships and bonus points which keep things interesting, but by today’s standards the gameplay is very limited when compared to other shooters on the NES, such as Zanac. The simultaneous bombing and shooting element is a nice touch, but it doesn’t really add that much to the gameplay in reality. If you get hit by a single bullet, you lose a ship and start again from a predetermined point. There are no power-ups to collect. The game simply loops the same 10 brief areas indefinitely until you run out of ships. While it's not a bad design, you don't see anything new after the first 30 seconds or so. As such, the game becomes tiresome pretty quickly. Occasionally, a large mothership will appear — you can try to shoot it down or wait until it leaves. The graphics and audio in the NES conversion are rather basic predictably. The brown and green backgrounds look vaguely like terrain, while the grey enemy ships more closely resemble geometric shapes than aircraft. Throughout it all, you'll hear the same siren-like music and blipping laser fire sound constantly, which may eventually drive you insane if you play this for too long. With shmup competition from the likes of Gradius, R-Type and Super Star Soldier already on the Virtual Console, it's hard to recommend this ancient arcade classic. 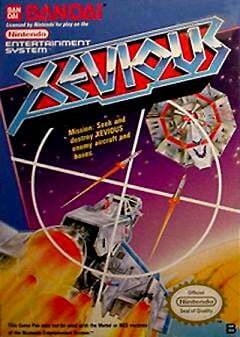 Xevious is far from being a bad game, but it has dated quite badly; we recommend that you spend your points elsewhere unless you happen to be a nostalgic fan. i've owned this game on the NES, Atari 7200 and the GBA all based on my memories of playing it at a Bowling alley when I was a kid.